Andy: Myers’s has a very unique, unmistakable smell. A strong molasses taste, but too rough to drink straight. Not bad mixed with Diet Coke to take some of the bitterness away. I’m not sure I would drink this by itself, but no fruity drink is the same with a floater of Myers’s Dark. Delicious as an ingredient, just not the ONLY ingredient. Adrian: OUCH!!! That has a very severe, rough burn. I wouldn’t drink it straight or as the sole liquor in a drink. Myers is a modifier…you want it to bring it’s richness to a drink, but too much is overpowering. Now, I will admit, almost every tropical drink isn’t a tropical drink without myers. This Myers’s rum can be incredible when used properly. I usually take about a 1/2 shot at a time. A good jolt. A little bite to it ? yes. But think what they had in the old days. Aye’ Matey! There’s no reason why you cannot drink this wonderful RUM straight, neat or right out of the bottle without mixing. But you do it slow ……. a couple minutes between sips. Wait five minutes and the sweet taste of molasses still covers your taste buds. Mixed with a cola you have the most flavorful RUM and coke ever made, ‘course most Rum and cokes use Bacardi Superior. Try it with a flavored seltzer water on ice. The first sip is not good, But it always gets finished fast and leaves me running with the Big Dogs ! Myers’s in a dark & stormy is the best. Not my favorite in a drink but I did like it used in a rum cake before I went gluten-free. Because it does have a bite it mixed well with the sugar and butter for the cake glaze, yum! Drinking it straight…no way, it is too rough unless you like having your taste buds melted off, ha! ha! I drink Meyers neat. Find the taste, aroma and after taste very smooth and no need for mix. used to float coke on top. Not needed and takes the full flavor and dilutes it. No finer rum as far as I’m concerned. Awesome stuff. Try this out. One teaspoon fresh grated ginger root. Three twists of lime. Reeds Jamaican extra ginger brew. One part Meyers. A half a part if that (kiss or a splash) of cruzan coco or Malibu original. Mix. Done. So good. Can add or interchange Cruzan black Strap for a real sweet mollases plantation punch type thing. Glad there is a place for us Rummys in the world. This rum is great! The first few times you drink it will be off-putting, but it gets better once you aquire the tastebuds for it, you’ll begin to notice how deep and flavorful the rum actually is beyond the initial bitterness. I agree with Coltrane. It makes a perfect Dark & Stormy. I tried other rums and I found them to be too light for this recipe; the rum flavor was lost in the ginger beer. 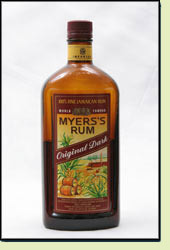 Myers rum holds its taste when mixed with other ingredients. I really like this rum! My favourite way to enjoy is at Christmas time with Eggnog. It is in my opinion the “only” rum to use in this drink. Sprinkle some fresh grated nutmeg on top, and voila, you have a delicious holiday drink. I’ll agree there are few dark rums I really enjoy straight but this makes for a nice addition to a very heavily flavored Zombie. That dark molasses is the lowest grade but each grade has a purpose. This is for mixing with drinks that include other lighter rums just to get that molasses flavor to stand out.